This Event has been read: 825 times. And there is no where on Earth more romantic that the city of Verona, the home of Romeo and Juliette. You may know from my subliminal e-mail messages over the last decade Amarone is one of my favorite wines on the planet. We plan at least two events that feature the best wines that this region has to offer every year. I would surely include the wines produced under the auspices of the Masi estate in this elite group from the Veneto. The Sergio Allegheri wines along with the Masi single vineyard Campolongo are spectacular and their Campofiorin has been our go to entry level Amarone for the last few years. Join us as we welcome the U.S. Director of Masi Agricola Tony Apostolakos to host a tasting of the entire line-up of Amarone from this historic estate. Chef Toni Lampasone will be presenting a special menu to accompany the tasting wines, the fee for this tasting is $125 + tax for reservations call 954-523-9463 or e-mail andy@winewatch.com. The blend is 70% Corvina, 25% Rondinella, 5% Molinara. One of the classics of the great Veronese tradition, made by Masi in a contemporary style. Valpolicella Classico, praised by Hemingway as "a light, dry red wine, as friendly as the house of a favourite brother", is made in an elegant style full of simplicity and freshness. A blend of 70% Corvina, 25% Rondinella and 5% Molinara. With an intense, ruby-red color and violet traces, the wine shows generous, ripe aromas of plum and cherry jam, with hints of spice. Bold and rich flavors of bitter cherries and berry fruits stand out on the palate, with good acidity, balance and velvety tannins. ‘Brolo’ is equivalent to the French ‘clos,’ a walled vineyard. This special selection of Campofiorin expresses the individual style of local Veronese varieties (particularly Corvina) and the original methods of appasimento and Masi’s double fermentation. This dry, rich, velvety, complex and elegant wine is aged in small oak barrels. Brolo di Campofiorin vineyards are located in Valgatara di Marano, in the heart of Valpolicella Classico, where grapes for the original Campofiorin are grown, with very deep alluvial soil on eocenic limestone. 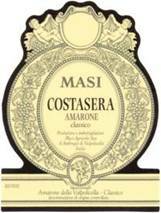 Like Campofiorin, this wine is produced using Masi’s double fermentation system. Wine from fresh grapes undergoes temperature-controlled fermentation with selected yeasts. The end of November, the wine is re-fermented, with 30% of semi-dried Corvina grapes. Malolactic follows fermentation. The wine is aged in 600-liter ‘fusti veronesi’: Allier and Slavonian oak barrels, before a period in bottle. Masi Campolongo Torbe Amarone 2007v/2011v. Within Negrar commune, this well-ventilated vineyard has southwest exposure at 375-400 metres elevation, and soil of deep, red eocenic limestone with good drainage, many stones, and beneficial mineral content. Amarone is made with the ancient method of 'appassimento' (drying of the grapes). At end of September or beginning of October, bunches are dried on bamboo racks. By mid-February, the grapes weigh 35-40% less and only Corvina is affected by botrytis. After pressing, the dried grapes are partially de-stemmed, fermented for about 45 days in large Slavonian oak botti, at very cold, natural temperatures until the sugar has completely transformed to alcohol, and malolactic occurs. The wine is aged 3 years: 60% in 30-40 hectoliter Slavonian oak botti; 40% in 600-liter Slavonian and Allier oak casks, new and 1, 2 and 3 yrs. old; minimum 6 months in bottle. The fee for this tasting and dinner is $125 + tax, for reservations call 954-523-9463 or e-mail andy@winewatch.com. Please let us know when you make your reservation if you have any food allergies or preferences chef Toni will be happy to accommodate you if you don’t eat raw beef. Sandro graduated in Business and Economics at the Catholic University of Milan in 1964. He took charge of the commercial and marketing development of the company from the start of his career. Internationally recognized as an innovator and promoter of wines from the Veneto on the world stage, Sandro was involved in the foundation of the modern wine fair Vinitaly in the 1960s and today part of the fair's Technical Commission. President of Masi Agricola SpA since 1978.Creator of the Masi Prize in 1981, he is also co-ordinator of the Masi Technical Group and Vice-President of the Masi Foundation. His activities in the development of winemaking, and the promotion of wine and its associated cultural aspects, are widespread and well recognized. This work has led him to become a member of numerous local associations and promotional bodies at a national and international level. He is the prime mover behind leading promotional bodies abroad such as the Istituto Grandi Marchi (Institute for Leading Brands) and Excellence from Italy. The signature Amarone, Coastasera is named aptly because the coasts which face the sunset are the best ones in Valpolicella Classica for producing a high-quality Amarone. Here, where the day is longer, the vines, which overlook Lake Garda, benefit from the reflection of its light and its milder climate. The 2011 vintage produced wines that are have excellent structure with good freshness that are drinking nicely at this young stage in their life. Proud, majestic, complex and exuberant: this is Masi's gentle giant. A benchmark for the Amarone category, which, together with Barolo and Brunello,makes up the aristocracy of the Italian wine world.